The Mountain House Belleeks was the venue for the annual awards evening of the Slieve Gullion Wheelers cycling club. Proprietors Jim and Yvonne Rocks welcomed the club members and their guests as a hot and cold buffet was served to all present. Club Secretary Kevin Kenny then welcomed representatives from the club's three nominated charities to come forward and accept a cheque for one thousand pounds each. All three representatives thanked the club for their generosity and spoke briefly of the work of each of their charity organisations. 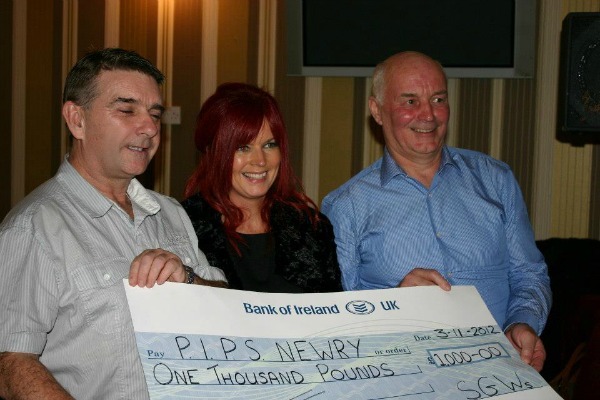 Seamus Mc Cabe accepted the cheque for P.I.P.S. Newry & Mourne, Paddy O'Hanlon received the cheque on behalf of Cancer Research and Barbara Sands accepted the cheque for the N I Leukaemia Research Fund. The club will also make donations to The Children's Hospital in Crumlin, Dublin and the RNIB.